Discorder Magazine celebrated its 35th anniversary by showcasing a diverse range of artwork at the Hatch Art Gallery. 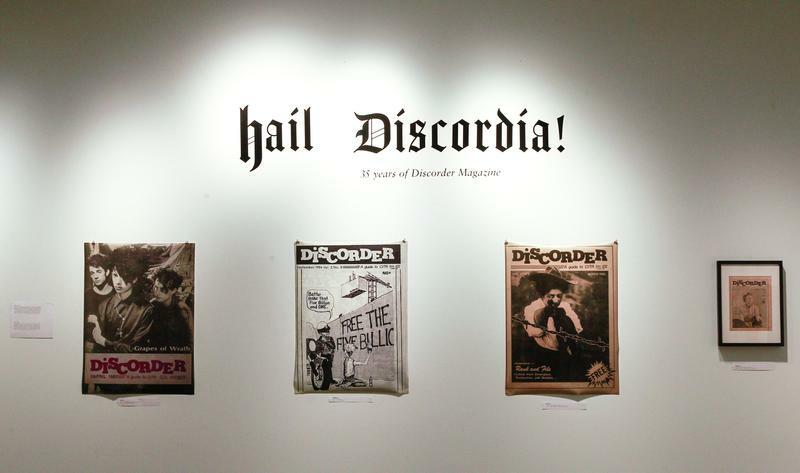 Titled Hail Discordia, the exhibit displayed one cover from each year of its existence. “When it came down to one [cover] every year, I mostly selected for what showcased Discorder’s diversity,” said Ricky Castanedo Laredo, art director at Discorder Magazine. At the exhibit, it is intriguing to witness how the meaning of representation for the magazine has broadened over time, encompassing more voices. The artwork has a certain avant-garde feel to it, and a subversive undertone is apparent. “We wanted to use the cover art of the magazine as a way to tell the story of its ever-changing nature and showcase some of the wildest moments from our history,” explained Laredo. Over the course of the years, Discorder has seen itself revisiting old forms and aesthetics while also endlessly changing with time. The exhibit was primarily the brainchild of Laredo, former Editor-in-Chief Brit Bachmann and Halla Bertrand, business manager at CiTR radio station and Discorder. “The exhibit is just meant to serve as a celebration and a small sample of the magazine’s history,” said Laredo. He further talked about covers being the entry point for an issue of any publication. Published by CiTR since 1983, the magazine is the longest-running independent music magazine in Vancouver. Founded by Michael Mines and Jennifer Farni, the magazine’s focus was initially on radio and specifically music. Over time, the masthead reflected and engaged in art forms beyond music, like politics, comedy and activism. With globalization at its peak, it is easy to become disconnected with one’s city — thus, the magazine has refocused on the hyperlocal. “I think Discorder currently is trying to fill that void,” said Laredo.